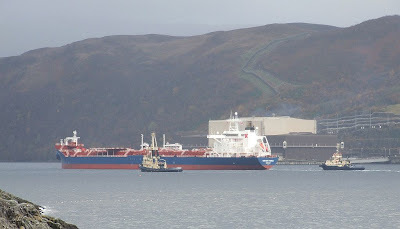 Two views of the shuttle tanker NAVION FENNIA in Loch Long this afternoon, on her way to the Finnart oil terminal to discharge a cargo of North Sea crude from the Ross Oilfield. The upper picture shows the 1992-built ship with the three tugs escorting her up the loch. On her starboard bow is AYTON CROSS, the latest tug to join Svitzer's Greenock fleet, while SVITZER MALLAIG is made fast to the stern of the tanker, and FLYING PHANTOM is off her port side. The second view shows NAVION FENNIA passing the Explosive Handling Jetty at the Royal Navy's Coulport facility. Originally named FUTURA, the tanker was built at Turku, in Finland, for that country's Neste Oil Corporation. In 2003, she was sold to Navion Offshore, a Norwegian subsidiary of the Canadian Teekay Shipping Corporation. Equipped to load over her bow from offshore facilities, NAVION FENNIA is 242.5 metres long, and has a deadweight of 95,195 tonnes. The logo on her funnel is perhaps of interest. The co-joined letters 'T' and 'K' form the abbreviated word for 'tank', used as shorthand by seafarers all over. Could this be the reasoning behind her owner's name? TK stands for late Company's founder Torben Karlshoej.